Coming from the hot arid regions of sub Sahara, and inhabiting the dry desert areas from Mauritania to Ethiopia, sulcata do not do well in wet, damp or cold conditions and can quickly become ill if kept in this type of environment. As hatchlings, Sulcata are miniature replicas of the parents with colouration ranging from golden yellow to chestnut brown carapace (top shell), to an unmarked creamy plastron (bottom shell) with forked gulars exaggerated in the males as they get older. As Sulcata grow they retain the beauty of hatchlings: their huge front legs, designed for digging, are adorned with large spiny projections and their rear legs feature at least two large spurs (tubercles). 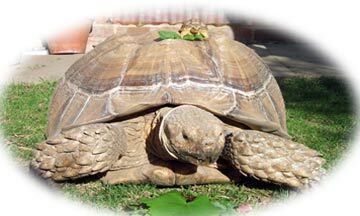 Being the third largest tortoise in the world, the Sulcata is a huge, powerful, destructive, non-hibernating species, that requires a large heated area throughout the winter and poor summer months, which is very costly and difficult to achieve for most. This is a tortoise for the serious keeper where ongoing expense is no object.